We had a fantastic long weekend in Kansas City recently and this was one of my favorite dishes. I had a hard time deciding what to order at The Corner Restaurant, because it all looked so good! 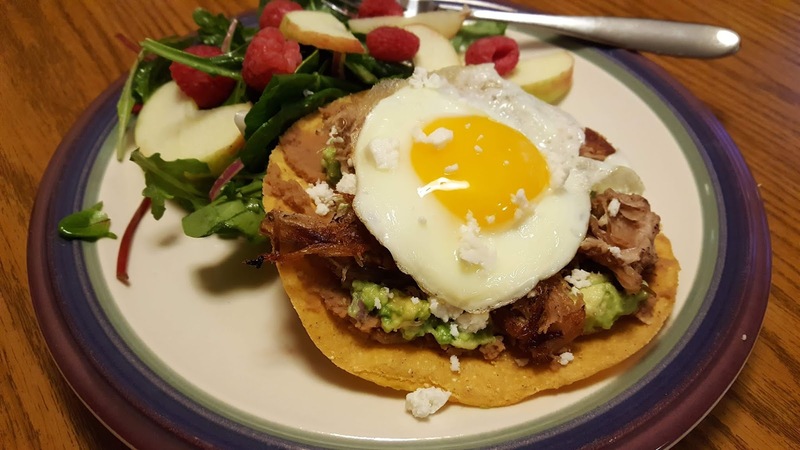 But these tostadas won the morning, and now they have won themselves into the rotation at our house. And how could they not?? 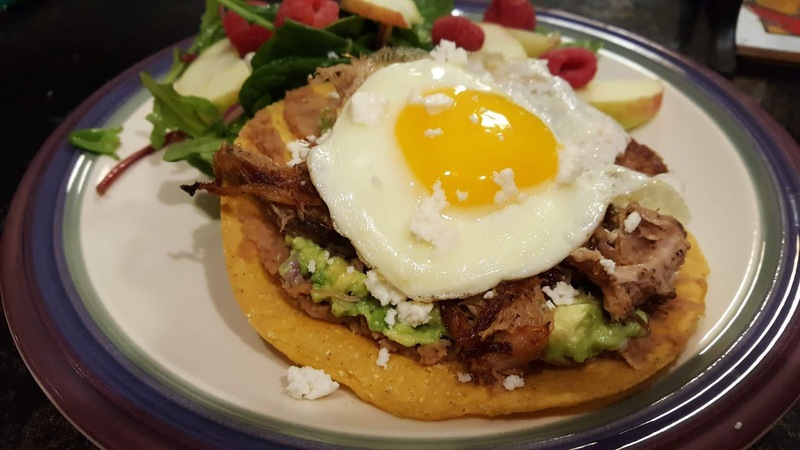 Crispy tostadas are topped with refried beans, guacamole, carnitas, queso freso and a sunny side up egg. The whole thing is just SO wonderful - and I can't wait for you to try it. My kids exclaimed "you can make these again!" which is about the winningest endorsement I've heard. And I definitely will, if only because I love them so much! If you've never bought tostadas before, they should be widely available in the Mexican aisle at your grocery. I bought mine at Aldi and they were cheap (shocking) and delicious. I suppose, if you're really ambitious, you could fry your own. Queso fresco, a Mexican cheese, is crumbly like feta and usually comes in a round. It also is widely available, even at Aldi. I had leftover carnitas in the freezer that I simply warmed and crisped up in the frying pan. 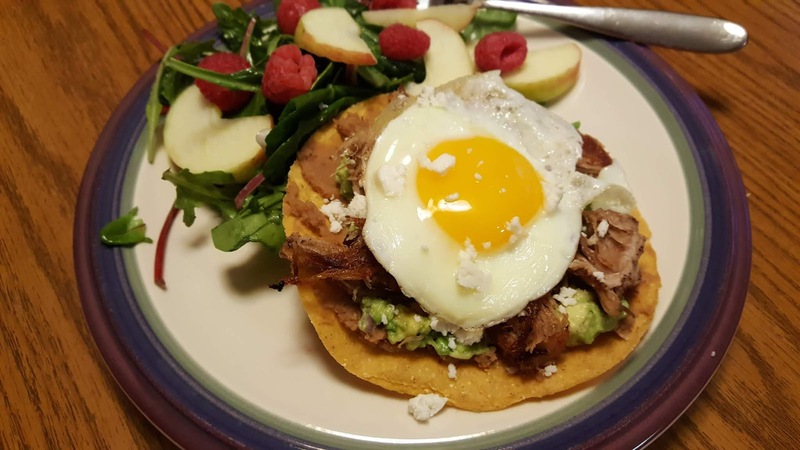 You won't need the whole recipe of carnitas for these tostadas, so be sure to put quesadillas or tacos on your menu for later in the week. Or, freeze the leftover carnitas - they freeze beautifully. Also, it should be noted that I named these "brunch tostadas" because they have an egg on top! (And because I did eat them for breakfast at the restaurant.) However, at our house we eat them almost exclusively for dinner. So, no matter what they're called, I hope you will try them soon. Get more great ideas at Inspiration Monday, Busy Monday, Inspire Me, Hearth and Soul, Fabulous. Prepare the guacamole by peeling and crushing the avocados. Stir in the red onion, lime juice, garlic and salt to taste. Heat the tostadas in a 400-degree oven for 4-5 minutes or until fragrant and hot. Warm the beans in the microwave or in a saucepan on the stove top over low heat. Heat a skillet over medium heat and spray with nonstick spray or melt 2 tsp butter. Cook the eggs until desired doneness, sunny side up. Spread the refried beans among the tostadas, then top with guacamole. Place about 1/3 cup carnitas over each, then top with a cooked egg. Sprinkle queso fresco over the eggs and serve. Makes 8 tostadas.